A very substantial black colt this year, with three socks and a bright star – we are calling him “StarPower”. 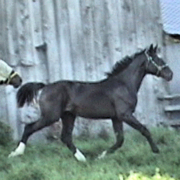 This breeding of a GOV Oldenburg foal is a repeat of the Starlight breeding that gave us “Shining Bright” in 2009. I hope Shining’s blingy younger brother will be as good! Starlight, the dazzling Sandro Hit / Cordeur / Argentinus son is known for three beautifully expressive gaits, with a canter nothing less than exceptional. In 2008, at eight years of age he was schooling all the Grand Prix movements and competing successfully at Prix St. Georges. He had been undefeated on the line at breed shows in North America always earning the title of “Grand Champion” with no score under 85%. In 2007 he was chosen USDF/DSHB Horse Of The Year. In 2008 he wowed the judges, earning the title “Grand Champion Dressage at Devon”. StarPower is a big but gentle colt, who demonstrates bounce, balance and elasticity in his movement — very dashing in a shiny black siut with white accents! He has been SOLD to Maryland to become Paula’s dressage partner. Video below shows Star at 1 month and 16 months old.